There’s a new SWM in town… and it’s beginning to filter out to larger DIRECTV installations. It’s called the DSWM30, and while it’s not available at Solid Signal yet, it soon will be. It’s about the same size as a SWM-8 and it runs a lot cooler. It will service 30 tuners in two banks of 15, which means 6 Genies or 14 HD DVRs and 2 H25s, or 30 H25s, depending how you configure things. The two banks of 15 don’t talk to each other which is important if you’re using it for a large residential installation and utterly unimportant for commercial. The DSWM30 will work with residential and commercial installations that need 4K and international service at the same time. Using an external SWM will allow for the use of a WorldDIRECT dish and using a special LNB with 6 outputs, 4K service will work as well. The DSWM30 is already being installed for new hotel and apartment complex systems. Because of its low power consumption and small size, it’s much better than the SWM-32 or SWM-16 which were used in cases like this. In an apartment situation, it can be used to feed 6 apartments, all with Genies, which would have taken two SWM-32s in the past. It can also outfit 6 apartments with 4 tuners and 2 apartments with 3 tuners for retrofit installations where Genies aren’t needed. For hotels, it can supply 30 guest rooms, and there is a version of the DSWM30 that has a much higher output power and can be used with RG59 cable or for runs up to 300 feet. Most home users are going to want to stay with the 4K-ready Reverse Band Slimline dish which is a much better bet for home installations. 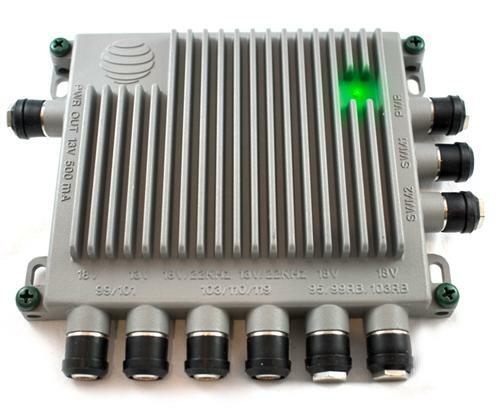 This dish will feed 13 tuners (and depending on the devices used, up to 21 tuners.) Unlike the external SWM all devices will be able to see each other. However, if you’re looking for a solution that includes a Genie DVR plus a whole bunch of H25s for a mancave or media room, the DSWM30 will be a good choice as well. DIRECTV is supplying DSWM30s to hotels and commercial installs now, but we expect that it will be available to Solid Signal customers within about a month, along with the necessary LNB to drive it. (While the DSWM30 can use almost any LNB, there is no need for it with anything but a reverse band LNB.) As soon as that happens, we’ll let everyone know — we’ll shout it from the rooftops!